/ “Just as in the Days of Noah”? Should You Be “Taken” Or “Left”? “Just as in the Days of Noah”? Should You Be “Taken” Or “Left”? What did Jesus mean that the time of his coming would be "just like in the days of Noah?" as Matthew records? Depends on who you ask! His analogy is usually terribly mishandled, often because teachers ignore Luke's version which includes a key detail that Matthew is missing about the days of Lot. What do both Noah and Lot's days have in common? And most importantly, who are those that are taken and who are those left? Which one should you be? Have read your e-book...extremely interesting. I certainly hadn't viewed Revelation as being literally interpreted..you have encouraged me to search the Word more frequently and considering some of those more difficult scripture in that light. My question is in regard to Matthew 24:36-44. Could you please tell me where you would place this event in the time-line of things, and how does it relate to the place of safety, and the 144,000. I have also heard it explained that the wicked would be taken, and the righteous "kept" or left behind as in the Days of Noah. How do you view this? Thanks for your time on this question. I love hearing how the plain, literal interpretations I teach have encouraged someone to study God's words more than ever because they feel they can understand things. Matthew 24:36-44 — 36 "But of that day and hour no one knows, not even the angels of heaven, but My Father only. 37 "But as the days of Noah were, so also will the coming of the Son of Man be. 39 "and did not know until the flood came and took them all away, so also will the coming of the Son of Man be. 40 "Then two men will be in the field: one will be taken and the other left. 41 "Two women will be grinding at the mill: one will be taken and the other left. 42 "Watch therefore, for you do not know what hour your Lord is coming. 43 "But know this, that if the master of the house had known what hour the thief would come, he would have watched and not allowed his house to be broken into. 44 "Therefore you also be ready, for the Son of Man is coming at an hour you do not expect. The question of who is taken and who is left here is one of my favorite Bible prophecy questions. Talk about "the difficult words of Jesus," this one had me confused for many years. Also, taken where? To the good place or bad place? Why is only "one" left and "one" taken? Is a 50% "rapture-rate" the point of the message? But this is typical with the high difficulty level of the Bible. Exactly What Will Be 'Just like the Days of Noah'? To solve these questions, first we need to be clear just what day and event Jesus is specifically saying is "just like in the days of Noah." The answer is that he connects it to the "coming of the Son of Man." Let's back up to the subject in verses 29-31 (skipping verses 32-35 about the Parable of the Fig Tree) to make no mistake about which day this is. Matthew 24:29-31 — 29 "Immediately after the tribulation of those days the sun will be darkened, and the moon will not give its light; the stars will fall from heaven, and the powers of the heavens will be shaken. 30 "Then the sign of the Son of Man will appear in heaven, and then all the tribes of the earth will mourn, and they will see the Son of Man coming on the clouds of heaven with power and great glory. 31 "And He will send His angels with a great sound of a trumpet, and they will gather together His elect from the four winds, from one end of the sky to the other. So this is the rapture right after Satan's 3½ year/42 month/1260 day Great Tribulation of wrath is completed. Jesus comes to gather his elect with the help of his angels into the sky on the last trumpet, the very Day of Trumpets or the "last trump" that Paul spoke of (1Cor 15:52). This correlates to the seventh trumpet of Revelation which of course precedes the seven bowls of God's actual wrath, now that Satan's short time is done (Rev 12:12). That ten-day wrath of God ends with the Second Coming of Jesus for the Battle of Armageddon as Rev 19 depicts. Please note that the "wrath of God and the Lamb" pronounced at the 6th seal is a red herring or misleading statement. It is important to notice who is making the statement: the masses of the world, not God, Jesus, John or even an angel. The panicked masses assume, "It's Judgment Day!!" because of how terrible the global Wormwood cataclysm that start at the 6th seal is. But besides the two apparent "wraths of God," there are other obstacles to understanding this. If you read this account alone where it says, "the flood took them all away," you can come away with the idea that "one shall be taken" is referring to dying as those outside Noah's Ark did. Luke's Account Clears the Bad Connotation to "Taken"
To resolve this ambiguity, it helps greatly to read the parallel account in Luke which tells us a detail that Matthew is missing. He records that it will be just like in the days of Noah and the days of Lot. 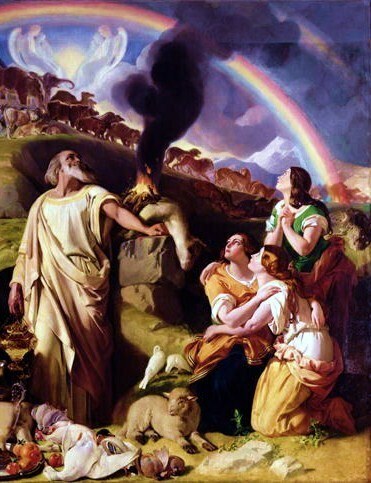 27 "They ate, they drank, they married wives, they were given in marriage, until the day that Noah entered the ark, and the flood came and destroyed them all. 29 "but on the day that Lot went out of Sodom it rained fire and brimstone from heaven and destroyed them all. 30 "Even so will it be in the day when the Son of Man is revealed. 31 "In that day, he who is on the housetop, and his goods are in the house, let him not come down to take them away. And likewise the one who is in the field, let him not turn back. 33 "Whoever seeks to save his life will lose it, and whoever loses his life will preserve it. 34 "I tell you, in that night there will be two men in one bed: the one will be taken and the other will be left. 35 "Two women will be grinding together: the one will be taken and the other left. 36 "Two men will be in the field: the one will be taken and the other left." 37 And they answered and said to Him, "Where, Lord?" So He said to them, "Wherever the body is, there the eagles will be gathered together." Did you notice from what I highlighted how this account differs? Luke says that the flood "destroyed them all" not "took them"...on the very day Noah entered the safety of the ark. Now we're getting somewhere! Further, he says about the days of Lot that those left behind after Lot left for safety were also "destroyed"...also on the very same day. Now the question of whether you want to be left or taken is clear. Jesus is telling us that God is consistent and that just as with the "just in time" rescue of the righteous before past judgments, also in our time on the very same day that we are gathered to the sky in the "rapture" the judgement of God will fall on the Earth. Which judgement is that? The seven bowls are identified in Revelation as the wrath of God following the 7th trumpet (whereas in contrast, the seals and trumpets are not God's judgments, although the group of all 21 events are often incorrectly collectively labeled as such). Therefore, the lesson of Jesus' analogy is this: "be ready" because you will "not know" in advance exactly when the rapture will happen, and there will be no time to get ready once it starts because (the first bowl of) God's Judgement will follow immediately after—just as the flood did in the days of Noah and just as the brimstone fell in the days of Lot! If you want to be among those "taken" to heaven before judgment rains on earth you had better start now. If Everyone Is Gathered, Why are Some Working and Some Sleeping? This passage and others seem to contradict the single "place of safety" view that Revelation 12 teaches, or that God's servants will be gathered in one place. Why? The problem is in how Jesus mentions that some will be working in the fields and at baking and some will be sleeping. This makes no sense unless those taken are scattered on different sides of the globe in different time zones (sorry, flat earthers). Another problematic passage is Mark 13:27 which says, "He will send out the angels and gather His elect from the four winds, from the end of the earth to the end of the sky." Again, why would there be such language unless those raptured were not scattered everywhere? This is where understanding the 144,000 and their mission comes to the rescue. My book demonstrates that Elijah and the 144,000 are the ones who receive and broadcast the three angel messages (Rev 14:6-13) which partly fulfills the end time return of the preaching of Jesus' Gospel of the Kingdom message that Jesus predicted (Mt 24:14). (Elijah must start preaching the Gospel sooner for repentance before the end. When civilization goes down, he'll pass the baton to the 144,000.) If you ever wondered why the 144,000 alone have the mobile protection from Satan's attacks (Rev 7;9:4), that is why. They alone will need it because they will be out delivering the witness to the world before the end comes. The rest of God's servants will be in a single safe place for the duration of the Great Tribulation as Revelation 12 describes. Therefore, when the rapture happens, God will have some living servants in every part of the world. In this way, those taken will come from nearly every time zone or from parts of the world where it is morning, noon and night just as this parable depicts through the two women baking bread, two men working in the field and two sleeping in the same bed, respectively. If it was not for the protected 144,000 still being out providing the witness up until the end of the Great Tribulation, Jesus could not have described the three parts of day scenarios affected by the rapture! Why Are People Having So Much Fun in the Great Tribulation? By the way, this passage highlights a grave misunderstanding about the "Great Tribulation." Who is it a "trouble" to? Everyone? No. Only God's people (and those few nonconformists who reject the mark). Notice how Jesus said that people will be marrying, drinking, planting and building otherwise having pretty normal lives. How is this possible. Perhaps you pictured the Great Tribulation to be like a hell on earth for the receivers of the mark. Torture, etc. But according to Jesus it's going to be a time of great prosperity full of expectation and planning for a bright future for the majority who took the mark. The reward for taking the Mark of the Beast will be no empty promise. The Beast will rebuild the world devastated by Wormwood as the 6th seal through 4th trumpet graphically record. This is also why there can be a surprising sudden destruction on them. They are busy serving their false god of Satan (2Th 2:4) in his newly ordered world. That all ends right after angels are seen taking God's people to safety (and it will culminate nine days later with the 7th bowl on Tishrei 10, Yom Kippur, the Day of the Lord when Jesus returns as Rev 19=Lev 16 describes). I hope this helps you see what "just in the days of Noah" really means...and what it does not mean as Jesus used it. It's not talking about giants coming back, or a flood, or something else from Noah's day being seen again as many mistake it. The specific point Jesus was drawing from the analogy to Noah's time was that God's judgment always falls right after he takes his people out, as Lot's time also demonstrates. If you're not sure you're ready for the rapture, read my article on the rapture requirements next. In your article ” As in the days of Noah” “Should you be taken or left” I must have missed something – because it sounds like a pre-trib rapture? Sure it sounds “like” the pretrib rapture except replace wrath of Satan (Great Tribulation, 5th trumpet) with the wrath of God (the 7 bowls) for what event it comes before that the righteous are taken out from. “After the tribulation of those days” is definitely post-trib! As I often do I was purusing some of your older articles and ran across this one as well as another one that talked about the 144,000 being the ones to spread the good news world wide. Your position seems to have changed on who fulfills the good news of the kingdom being preached to the whole world. If the 144,000’s mission is not to bring the good news world wide, since, if I understand correctly, this will have already been achieved, is there a different mission they are achieving? Sam, good catch. Yes I just checked and in my earlier writing I only connected Mt 24:14 to the 144,000 because they are specifically tasked with preaching that based on their association with the 12 and 72 who did it 2000 years earlier. I made no mention of Elijah in this. But yes in the last couple years as I came to understand what the Good News of the Kingdom Jesus taught really was I saw it had to be preached for the purpose of worldwide repentance much earlier along with the warning for people to flee. =) I have updated the article above to reflect Elijah’s role, too, as starting first and then passing the baton to the 144,000. Whether the earth is a globe or flat, there is still day and night at different places at the same time. Mike, light does not work that way. You can’t have complete dark and light on a disk at the same time even if the sun were a “spotlight” (which is absurd). Anyone who has used a flashlight knows you can see the light from the side even when it’s not pointing at your direction. Plus a huge portion of the sky would always be blue. 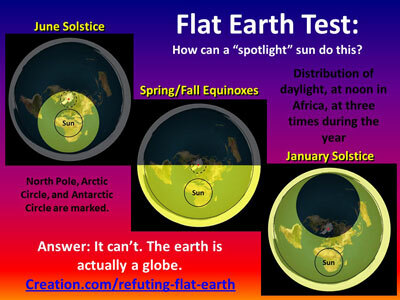 Timezones (and even the differing distribution of sunlight coverage during equinoxes and solstices) require a spinning globe earth, at least for east to west. I never mentioned a spotlight , I just said that its possible for there to be night and day at 2 different places on earth whatever form the earth takes. you make no mention of the Abomination of Desolation in this article…care to explain how that ties in? The end does not come because the gospel of the kingdom is preached throughout the world but rather because the son of perdition and the rebellious stand (not the falling away)has happened…what is your understanding? Carol, you’re confusing a sign of the end with a prerequisite to the end. The Gospel of the Kingdom going out worldwide is the only precursor sign of the end that Jesus gave (Mt 24:14). The abomination of desolation is just a milestone marker right before the Antichrist takes over. Only those who disbelieved the gospel message and adopted a “wait and see” approach instead will be in a position to take any action at the abomination of desolation. The period in Mt 24:14 was put in the wrong place…then and when answers the question…”THEN the end shall come WHEN you see the abomination of desolation.” Yes the gospel will go out to all the world before this but this is not what brings the end (how could it?) as some people teach. Carol. Periods don’t matter here. Just look at the words. FIRST X (.) THEN Y. Or maybe I forgot to mention that the Gospel of the Kingdom (X) also comes with a warning about fleeing to safety so you avoid dying in Y, the end. In reading a few of your recent articles about the Beast and False Prophet, specifically that they are sent to the Lake of Fire ahead of the judgement of humans at the White Throne, it did get me thinking about those in the days of Noah who were apparently the offspring of fallen angels and human women. Didn’t you mention somewhere that those offspring today are the likely candidates for other positions of power on earth, such as leaders or those who influence leaders? Kathryn, yes I think the ten rulers of Revelation 17 are Nephilim as my article on Nephilim talks about. The search feature of this site is improved would have found that for you (it’s what I used). After reading your article I gathered that the 144,000 will be the ones taking the gospel of the kingdom to all corners of the world while all others will be gathered to a place of safety that seems to contradict the place in Revelations which talks about those who were beheaded for rejecting to bow down before the beast or to take his mark. Femi, no contradiction. Those who are beheaded are not the 144000, nor the Woman, but another group out of four possible end time groups. I have always wondered why so many people disregard Matthew 13:24-43 when discussing the rapture and the one taken and one left. In Christ’s own words it appears as if the first taken are those that are the “children of the wicked one”. John, the point of the Parable of the Tares is not to present a complete end time timeline. The point is to fill in the timeline presented elsewhere (Revelation mainly) with important truth about the fate of the Nephilim and demons. Elsewhere it’s clear the rapture is first, then ten days later the defeat of the Antichrist and the draining of the swamp. The interpretation of the parable by Jesus does not clearly contradict this. I pray for all those that are awaiting a rapture to escape the times ahead. I pray that when it does not happen that their faith will not fail them. For some the rapture is thing they wait for most rather than the coming of Christ. You are correct. The tares are gathered first, just as the wicked are taken (they die) and others are left alive. Mt 24:28, about the carcasses and eagles, is a sign for the elect still living at the end of His real return–thus some will live to see it. It’s about the bodies of the slain (by the Lord, in judgment) being eaten by birds (Rv 19:17-18, 21; Ezek 39:4, 17-20). A pre-wrath belief will make a person better prepared for Tribulation than pre-trib, but the truth is post-wrath. Annette, post-wrath is not the truth. Post-trib/pre-wrath is what Jesus taught about the timing. Tim, why aren’t the 144, 000 simply firstfruits, like the verse says – and temple rituals + Lev 23 Holy Daus show the pattern of what firstruits are? What’s used in scripture to support they’re preaching the gospel? Furthermore, some claim as a ‘post Church Age’ evangelism force. Ben, the role of the 144,000 is not explicited stated in Revelation. You have to connect the Gospels mentions of Luke’s 12 and 72 to deduce their function and why they alone are protected to be witnessing apostles to the wicked world. See my book for the full explanation. Tim, I don’t understand how Matthew 24:22 ties into this. If the wicked are thriving and everything is going great before the 7 bowls, why does Yeshua make the comment about the days needing to be shortened or else nobody would survive. I thought maybe it was during the last 10 days of God’s wrath, but I don’t know how that would benefit the elect because they won’t be on the earth at that time. Thomas, I can’t answer why there will be total genocide as it is not specified. I suspect that Satan when he believes his reign of being worshiped is over, will want to kill everyone made in God’s image. However, up until then, if you want to have people worship you, you best keep them happy, yes? Dear Tim, thanks for the wonderful work. I still believe there is two phases of Jesus’ coming, one is Jesus coming for His saints(Rapture) and the other Jesus is coming with His Saints(2nd coming). Your comment? Joshua, there are two phases, ten days apart. He comes for the resurrection/rapture on Tisrei 1 (Day of Trumpets/Rev 11) to take them to the marriage supper of the lamb (Rev 16) and then comes back with us on Tishrei 10 (Yom Kippur/Rev 19). I’m not sure if this “additional” group has been mentioned previously but what about the ‘remainder’ of the “Woman” who are not rapture ready (such as children,etc…)? What will become of them during the 9 days of God’s wrath? Zachary you’re referring to my article on the rapture age cut off. I assume angels will be assigned to care for them. Good stuff, if we are to compare every possible scenario between the rapture and the times of Noah and Lot, we might as well not neglect the fact that very few were saved compared to the ones destroyed. For noah it was only 8 souls against the whole population of their day, similarly it was with Lot. 1. Now, if we are to take that to consideration, do you see the possibility of “every” born again Christian being raptured? We must be having millions of “professing” born again Christian’s in the world today. 2. What’s your take on those who believe some Christian’s who are not “rapture ready” so to speak, will be left behind. Reference can be made to the parable of the wise and foolish virgins. Imputed righteousness versus practical righteousness: can Christian’s live any how and expect to be raptured? I like to hear your views on these few lines, seeing you’ve taken some time searching on eschatological subjects. Paul, see my article on rapture readiness that most Christians fail to meet which is why Jesus warned many Christians would hear “depart from me I never knew you”. If you try to tell them requirements for eternal life from Jesus own words (Mt 19:17-19) they reject it as “salvation by works” and stick to their Christian cheap grace. Take note that in rev 14:14 the sickle held by the Son of man was used for the harvest (rapture)of the earth (verses 15,16), but another angel in verse 17 had another sickle for casting the clusters(unsaved Israelites) of the vine(Israel),verses 18,19 into the great wine press which is the wrath of God,which according to rev15 : 1 ,the same great wrath of God, starts at the beginning of the first vial. The elect gathered by angels from the uttermost part of the earth,to the uttermost part of heaven needs to be understood within the context of mark 13:27. The verse before 27 tells us the Son of man is coming with power and glory . Does Christ come at the second coming or at the rapture? Obviously this is the second coming. In the 1st century AD, what did they mean by the uttermost part of the Earth and uttermost part of heaven? Coastal areas by the river,sea ,ocean were called uttermost part of the earth, while mountainous regions close to clouds,skies(ouranos in greek for heaven) were called uttermost part of heaven. So we have remnants of Israel (Isaiah11:11 islands of the sea/coastal areas ) who have survived the great tribulation being gathered from coastal areas back to the biblical mountains of the promised land and not the tiny Israel of today. But why are they being gathered on mountains? Remember Daniel9:26 said the end will be with a flood? Only those on God’s biblical mountains will survive a world wide flood. Those HIDDEN ones of Psalm 83:3 ,are the people who after seeing that abomination in matt24 /mark13 run to the mountains to HIDE . But on /in which mountain ? The mountain of Azal/petra in zech 14:5 found in the city of Moab in Isaiah 16:4 ,but because Moab is not their native country they are called outcasts(Refugees) . This Moab is the same wilderness of rev 12:14 where the woman (outcast of Israel)is fed for times,time and a half. Do not confuse the son of man(prophets) in the old testament , with the Son of man(CHRIST) in matt24:30, mark13:26,lk21:27,with the ANTICHRIST of Luke 17:30 who is revealed to the whole world. This cannot be Christ because ,Christ was revealed to his disciples. HOW MANY TIMES WILL CHRIST BE REVEALED ? The Antichrist/son of man in lk17:30 is revealed in 2th2:3,6,8. Please be careful about the ANTICHRIST of lk17:30 who is also called “Son of man”. Could you please explain to me regarding the parable of the Wheat and the Tares in that the tares are gathered first and then burned while the wheat is gathered afterwards and put into the barn. I realize it is a parable but it seems contradictory. Please reconcile this for me. Thank you for your insights. Yah bless you. Douglas, you already answered your question, almost, but you might need to read Matthew 13 a few times more and notice Jesus says that he used parables to hide the mysteries of the kingdom from you. Parables like this use a commonly known first century life situation to teach usually one point. Several of the parables skip over details found in Revelation, such as the second resurrection because they are not important to the point. Also, their purpose is not to replace Revelation that reveals these mysteries better, but to teach that one point in an obfuscated way, because, as he said, he was trying to hide these things from all but the very wise in the end time (Dan 12:4,9-10). Most Christians read Mt 13 and mentally exclude themselves from those Jesus was using parables to confuse. But here we are all confused about the parables =).